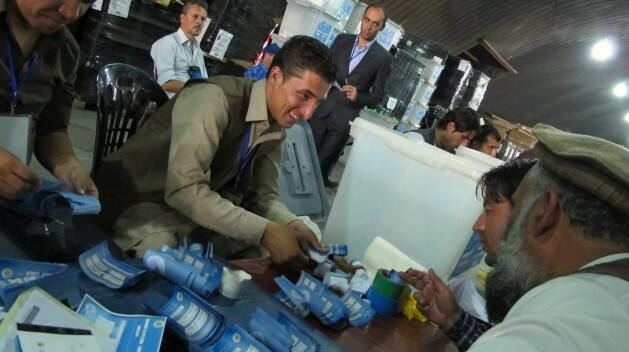 KABUL, Aug 20 2014 (IPS) - A knife fight late Tuesday among several auditors at the Independent Electoral Commission (IEC) still inspecting the results of the presidential elections held in mid-June could be the stab in the back for what has been a painful election process. The vote audit process was resumed following a three-hour delay on Wednesday, a commission official said. Two months after Afghans voted in a second runoff for election of the country’s president, ballots are being recounted amid growing questions on who is really arbitrating the process. The four corrugated iron barracks east of Kabul that constitute the centre of the Independent Electoral Commission (IEC) of Afghanistan in which the 22,828 ballot boxes are piled up, have become the Afghan insurgency´s main target. In the June 14 runoff, presidential candidate Ashraf Ghani Ahmadzai won 56.44 percent of the votes, while his opponent, Abdullah Abdullah, received 43.56 percent, despite having been the most voted candidate in the first runoff on April 5. The turnout was equally surprising: eight million out of 12 million voters, an unlikely figure given that most polling stations were reportedly empty on election day. With Abdullah Abdullah’s allegations of massive fraud having put the electoral process on the brink of collapse, the two candidates were persuaded to agree to a full ballot recount. In an audit that started mid-July, the ballot boxes are being examined by a team formed by auditors of both candidates and members of the IEC. Afghan as well as European Union observers are also on the spot in a process closely monitored by U.N. assistants. “I have spent the last two weeks taking part in this massive farce,” Abdullah Abdullah´s auditor Munir Latifi told IPS. “The United Nations and the Independent Electoral Commission are working together so that Ghani takes the win but there´s nobody supporting us,” he said before returning to his seat. Latifi has to discuss whether the handwritten “V”, “X” or a circle on each candidate´s tick box is repeated in several of the ballots, or if it is really “one person, one vote”. Boxes suspicious of fraud are put in quarantine and records are taken by hand in a notebook. Similar handwriting among different ballots “doesn´t necessarily imply fraud,” he added. “In the most remote villages of Afghanistan almost everybody is illiterate. Families simply show up at the polling stations and the one who can write marks their ballots,” explained Ayubee during the lunch break. The most suspicious ballot boxes are those that arrive unlocked, the ones that boast over the maximum of 600 ballots, or even random objects such as traditional felt hats or tobacco packets. Many auditors claim that full boxes arriving from Taliban-controlled areas should be systematically discarded because the Afghan armed opposition consistently prevents the population from taking part in elections. He stressed that all the auditors had received training on IEC procedures and invalidation and recount criteria before they could start working as advisors. Confusion over who has the last word in the audit grows while pressure from the outside strives to break the poll deadlock. NATO Secretary-General Anders Fogh Rasmussen has recently warned that the alliance will be forced to take a decision regarding the withdrawal of foreign troops from Afghanistan unless the new Afghan president signs the security agreements. According to Rasmussen, the NATO summit scheduled for September 4-5 in Wales would be “very close” to a deadline for taking that decision.